The B.C. 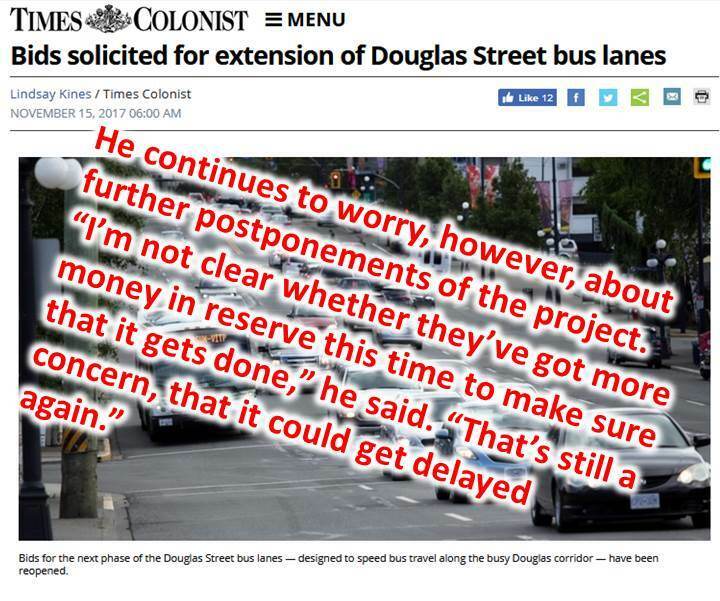 government and City of Victoria have reopened bidding on construction contracts to lengthen the priority bus lanes on Douglas Street. The Ministry of Transportation issued a call for bids Tuesday to extend the northbound lane from Tolmie Avenue to the Burnside Bridge, where Burnside and Interurban roads cross under the Trans-Canada Highway. The City of Victoria has invited bids on work to extend the southbound bus and bike lane from Tolmie to Hillside Avenue. Both projects were put on hold this year due to high bidding costs. A report to the Victoria Regional Transit Commission in June said bids on the southbound lane, estimated to cost $2.1 million, came in 30 per cent over budget. The report blamed an “unusually high level of construction work” in the region and its negative impact on the availability of workers and materials. The Ministry of Transportation, B.C. Transit and the City of Victoria worked over the summer before re-issuing the tenders. The Transportation Ministry decided to ask for bids on a longer northbound stretch after initially issuing a tender last February on a lane that ran from Tolmie to Saanich Road. The provincial project is expected to be done by fall 2018 at a cost of about $12.75 million. The B.C. government will contribute $8.1 million and the federal government will add $4.6 million. Eric Doherty, a spokesman for the Better Transit Alliance of Greater Victoria, said adding bus lanes to the shoulders on a long stretch of the Trans-Canada will be “politically” significant. He continues to worry, however, about further postponements of the project. Saanich Coun. Susan Brice, who chairs the transit commission, said she has no desire to see the project stalled again. “I would definitely call an emergency meeting of the transit commission if I was advised that there was a problem with finalizing it this time,” she said. “The commission would need to look at [its] options. She said the hope is that the lanes will allow buses to move more quickly and, in the process, encourage people stuck in traffic to leave their cars at home and take public transit. View Royal Mayor David Screech and Colwood Mayor Carol Hamilton both welcomed the decision to proceed with tenders. Colwood and View Royal are working with B.C. Transit and the transit commission to explore the possibility of developing a rapid transit corridor along the Island Highway from Goldstream Avenue to the Trans-Canada Highway on-ramp near Six Mile Road. Previous Previous post: Another Letter to Editor!